An Engagement ring is a ring given as a symbol of dedication, love and commitment (to someone) between two people. It represents a long-life journey two people are embarked on and showcases their decision to want to spend the rest of their lives together. Not always as delicately crafted and polished, Engagement rings have been traced back to the first signs of human existence where before rings there were gifts that represented the couple who started their life together. Fast forward a little, some discoveries in Egypt show that Egyptians believed circles represent eternity. A man would give a ring to a lady that he really liked or loved, and this would show other people that he owned her, she belonged to him. The Romans believed that we have a vein from one of our left fingers that goes straight to the heart known as the “vena amoris”, the “vein of love” therefore we wear our Engagement ring on our ring finger as our partner is so close to our hearts. This had been debunked as a myth, however, Many people today still take this view. It’s romantic. Today, we celebrate love and commitment by giving someone an Engagement ring. Engagement rings today represent commitment and bonding to a person for all of time. 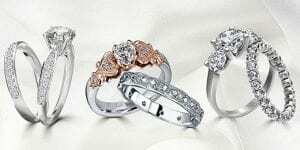 Engagement rings have changed over the years but each year they become more intricate and with modern technology much more meaning can be inserted into a ring and its design. Found the one you want to be with for the rest of your life? Congratulations! Knowing you found your soulmate and getting the Engagement ring to seal the commitment is such an exciting moment in life. Selecting the perfect Engagement ring is important as this will be the most treasured jewellery piece in your partners’ life. For guys, this task can sometimes be a challenge, deciding which type suits his lady best. It is recommended that he speak to her sisters or friends and get some clues as to what his lady likes. We give our gents peace of mind as we know how difficult this task is so we have a money back guarantee if he proposes in one month from purchasing the Engagement Ring. Some girls make this easy and share images of their dream Engagement rings, however, some girls don’t, and this makes their partner doubt his choice of ring up until the day she says YES. The Price of your ring? Once a guy decides he has met his dream girl that he plans on spending the rest of his life with, the old rule of thumb used was it has to be 2-3 months of your salary. We recommend you spend what you can afford. 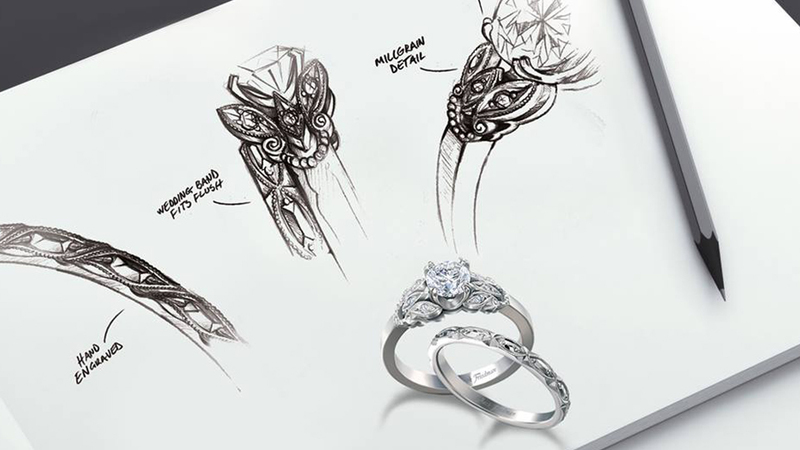 Provide us with your budget as well as your specs and we will recommend the best Engagement ring for you. It is important to remember that this ring will be a symbol of your marriage, we also recommend it to be as personal as possible. 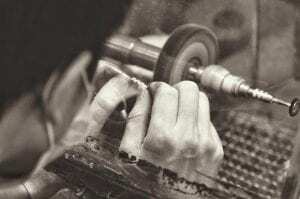 We encourage Engraving the Engagement ring. 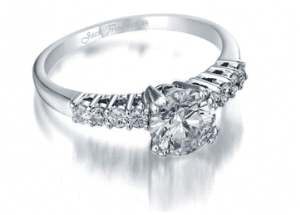 At Jack Friedman, one of our recommendations is that the Engagement Ring be set with a diamond in white metal, either white gold or platinum. This colour metal creates extra shine and in your Engagement selfies it will perfectly stand out. We also believe that’s what girls want to wear, something gorgeous and sparkling. You can now decide on the type of Engagement ring. Will your lady love a Solitaire ring with a diamond or a Halo style with many little diamonds around the centre diamond or perhaps a Trilogy design with two smaller diamonds complimenting the centre diamond? These are only a few types of Engagement rings. There are many more that I will mention in an article to come… Where we describe the different types of Engagement Rings. If you can’t decide… If it is really challenging deciding on the perfect Engagement Ring, another idea may be to propose with the diamond (buy a diamond here). Then after asking your lady’s hand in marriage and her saying YES, you can have her select or create her dream Engagement Ring and set the diamond into her ring. Selecting the diamond for your lady’s Engagement Ring. The next step after deciding on your Engagement ring is to choose the diamond for the ring. Some prefer a colour stone, others do not. 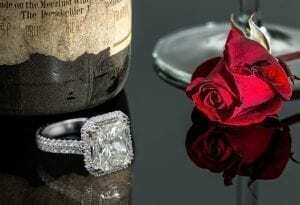 A diamond is the hardest precious stone and is perfect to symbolize your love bond as they are everlasting. Diamonds are the hardest stone precious stone and perfect for daily wear, hence your Engagement ring needs to be set with a diamond. The diamond has a hardness of 10. Other precious stones such as Rubies and Sapphires have a hardness level of 9 whereas Semi-precious stones such as Tanzanite and Amethysts have a hardness of 7. When it comes to the diamond, there are a few things that are extremely important to keep in mind, you want to get a diamond that comes to life with sparkle. You may know this but if you don’t, there are 4 very important aspects of a diamond. The 4Cs. The cut is the most important aspect to focus on when looking for the perfect diamond. A good quality diamond with a poor cut can sometimes appear lifeless. The good cut diamond will bring out every sparkle the diamond has to offer. When we speak of the colour, it’s the colour of the diamond and the whiter the diamond, the more valuable it is. The further you move down on the colour grading of diamonds, the more noticeable it becomes to see diamonds with a yellow colour. The colour of a diamond does affect the cost of the diamond however, anything from colour D – H is a good white colour diamond. Clarity is the inclusions in the diamond. Inclusions are particles that get caught in the diamond when it is formed long before it gets cut and polished. 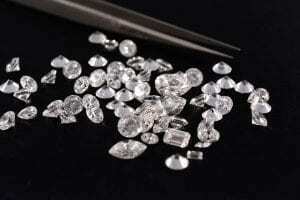 These inclusions can affect the brilliance of the diamond and therefore the sparkle, however, they are viewed as the characteristics of the diamond and therefore no diamond is the same. This is the total weight of the diamond. Keep in mind that the cut has a big influence on the carat. A larger carat diamond with a poor cut grade can appear smaller than a smaller diamond with a higher cut grade. Find out more about Jack Friedman via email on instores. Now that you have had some time to consider the above-mentioned advice and have decided on the perfect engagement ring it’s time to plan the proposal. There is no perfect proposal as everyone is different and likes different things. Some may want to be pampered and spoilt. Others may just want a quiet picnic at a place with a lot of significance to you both. Maybe under a tree, you shared your first kiss or the place you met. Maybe something recreating your first date. It’s important to think about all the little things that mean a lot to your partner and try to combine all these little ideas to create a really romantic proposal.